Genealogy Research Advice | Welcome to Past Perfect Genealogy Research! Welcome to Past Perfect Genealogy Research! I was just using a website for my own research when I realized I had to share it with other genealogists. I often have foreign names pop up in my research. Fortunately or not, most of these names are anglicized after the ancestors have been living in the United States for a while. The website Behind the Name: The Etymology and History of First Names solves many of my “What is this name in English?” Or, “What’s this English name in Spanish?” issues. For example, I needed to know what “Felix” was in Italian. Turns out “Felix” is “Felice” in Italian. VERY helpful! This information helped me locate a record I wouldn’t have found otherwise. The website also tells you the meaning and etymology of the name. There are numerous countries represented on this website; not just Italian and Spanish. I suggest you give this website a try next time you deal with foreign names in your research. It is informative and useful at the same time. First Cousin, Once Removed. Huh? Once removed, twice removed, etc., is a complicated-sounding system used by genealogists to describe the relationship between two cousins (related people) and the ancestor they have in common (also known as the “common ancestor” or “CA”). Many people hear “once removed” and think it means the people divorced. This is false. It has nothing to do with divorce and everything to do with “generations.” Allow me to further elaborate. Again, the word “removed” is nothing to be afraid of and not at all complicated. I thought I’d never understand once removed, etc., but acutally it’s quite intuitive. “Removed” simply indicates the number of generations, if any, separating the two cousins (two people with a common ancestor or CA) from each other. For example, the child of your first cousin is your “first cousin, once removed” because the one generation of separation represents one “removal”. Another example: Let’s take your mother’s cousin. She or he is also your first cousin, once removed. Why? Because the “once removed” aspect works in both directions along your family tree. • CA = common ancestor. Two cousins always have a unique common ancestor. You and your uncle’s children are your first cousins, right? Think about this situation for a minute. Do you have any first cousins? Who is your common ancestor? Your grandma, that’s right! • 2GGC = great-great-grandchild (meaning there are two “greats” before the word “grandchild”. 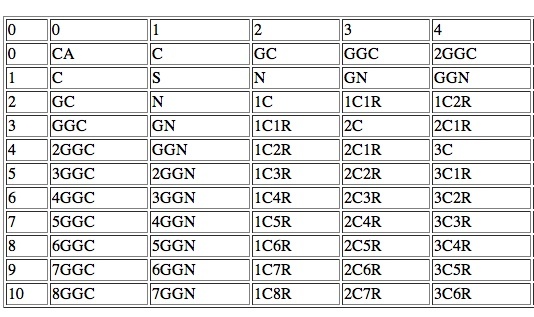 Look at it this way: 2GGC can be separated into: “2G–GC.” And, 2G = great-great. And, GC = grandchild. Put it all together, and you get great-great-grandchild! • GN – grand-niece (or grand-nephew). Note about grand-aunt, etc…. Many people confused with the words “great-uncle,” “great-aunt,” “great-neice,” on so on. Remember that genealogists use the word “grand-aunt,” grand-uncle, ” etc… No greats are involved unless it’s your direct bloodline. • 1C1R = first cousin, once removed (don’t panic). • 3C6R = third cousin, six-times removed. Okay, so now you have the definitions of the abbreviations, but how do you read the chart? Let’s break it down: How you find a relationship between you and another cousin. Step 1: Go to the upper left corner of the chart where it “CA” is written. Recall CA = common ancestor, or the person you and the other cousin have in your family tree that’s the same person. Step 3: This is where you need to think a little. You need to calculate your relationship to the CA (common ancestor). Put a little “x” in the box that matches this relationship. Are you his or her child? Grandchild? For example: I first go to the CA box. I am trying to figure out how I am related to my great-great-grandfather. I am his great-great-grandchild (remember great-great-grandchild could also be written 2GGC). I will now make a little check in this box. Step 4: Go again to the CA (common ancestor) box in the upper left corner. Step 5: Now simply repeat Step 3 considering the cousin your comparing yourself with, but this time, head down the chart, not across. Let’s say, for example, he or she is also the great-great-grandchild of your common ancestor. So next you slide your finger down the chart until you get to the box that states “GGGC.” (Remember, GGGC = 2GGC or 2G-GC or great-great – grandchild.) You can always break it down this way. Bravo! Step 6: Slide your finger along the row where your cousin’s box was, and move it to the right until you’re at the column where your box was checked. Step 7: Now, move your finger down to where the two lines (your column and your cousin’s row) intersect. Step 8: Way to go! You now have the relationship between you two. What is it? Did you get that you two are “3C” or, in other words, third cousins? What does this mean? It means both of you are the great-great-grandchildren of the same person. Let’s try some practice examples. 1) You are the grandchild (GC) of Bob. 2) Your relative is the great-great-grandchild (GGGC) of Bob. Question: What is your relationship? Answer: You are the other person’s 1C2R, or first cousins, twice removed! Did you get it right? Good! 2) Your relative (a female) is the grandchild of the CA (common ancestor). Question: What is the relationship between you and the other person? Answer: Niece. She is your niece. 1) You are the 2GGC (great-great grandchild) of the CA (common ancestor). 2) Your relative is the 7GGC of the CA (common ancestor). In other words they are the great-great-great-great-great-great-great-grandchild (7 greats) of the CA. Answer: 3C5R or third cousins, five times removed. Okay, now that you’ve started to master the “cousin chart,” what does removed mean again? Removed just means how many generations are between you and the person you’re trying to figure out your relationship with. Once removed = one generation separates you. Twice removed = two generations separate you. For example, your grandma’s first cousin, is your first cousin, twice removed. Your mother’s first cousin is your first cousin, once removed. Don’t worry. With time and practice this chart will come naturally to you. But, in the beginning, it sure can look confusing. Just remember, the next time someone asks you if “removed” means they were divorced, you can say, “No.” “Removed,” you reply is about measures generations, not degree of marital bliss (or lack thereof). Good job, and keep at it. Trust me. It gets easier with practice. As my grandma used to say, “Practice makes better…” Don’t worry about being perfect. Even I have to refer to the chart now and then! Have you ever wondered where other people live who share your last name? My last name is Bovitz, originally spelled “Bavec” back when my great-grandfather still lived in Slovenia. Once he settled in the United States, our surname was eventually anglicized to be spelled as it sounded. 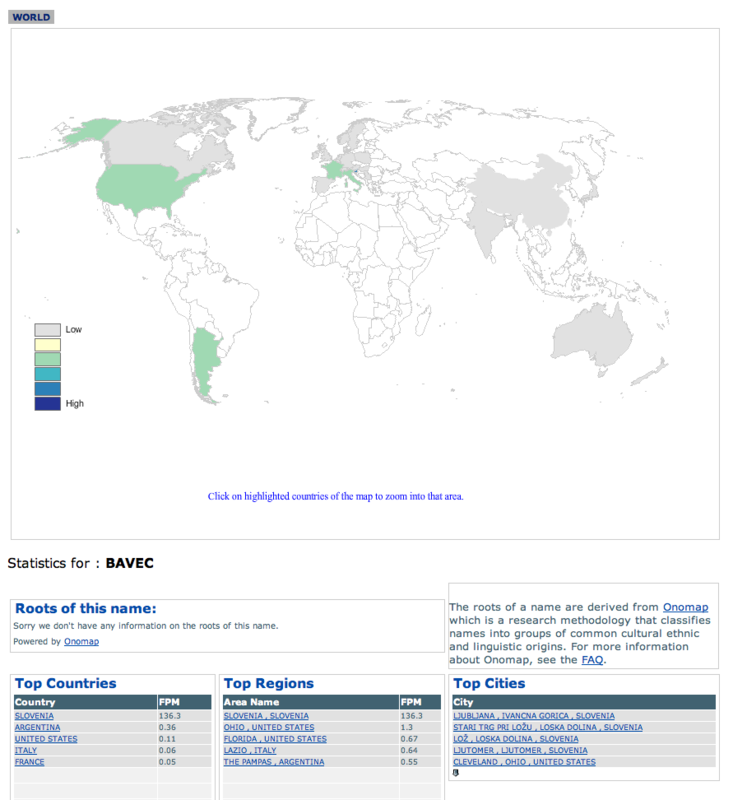 As a curious genealogist, one of my favorite web sites is the World Names Public Profiler. It was developed by the University College London based on telephone directories and electoral registers from the years 2000-2005. The data cover over 300 million people in 26 countries. What can a genealogist do with this web site? First, one can get a visual representation of a particular surname of interest on a global level. The data provide a curious researcher with how many people live in different areas around the world with the surname of choice. 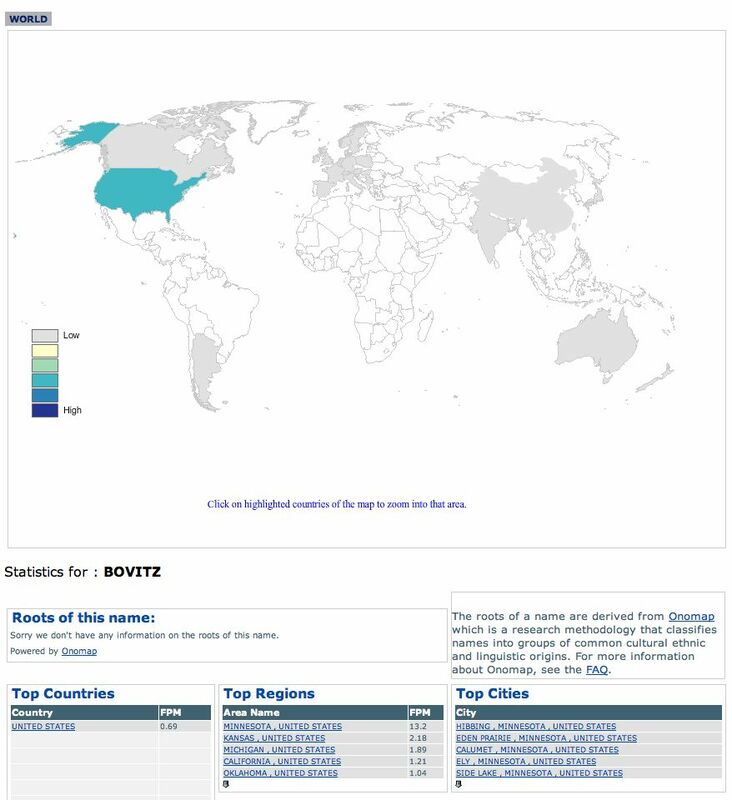 The "Bovitz" surname distribution worldwide. 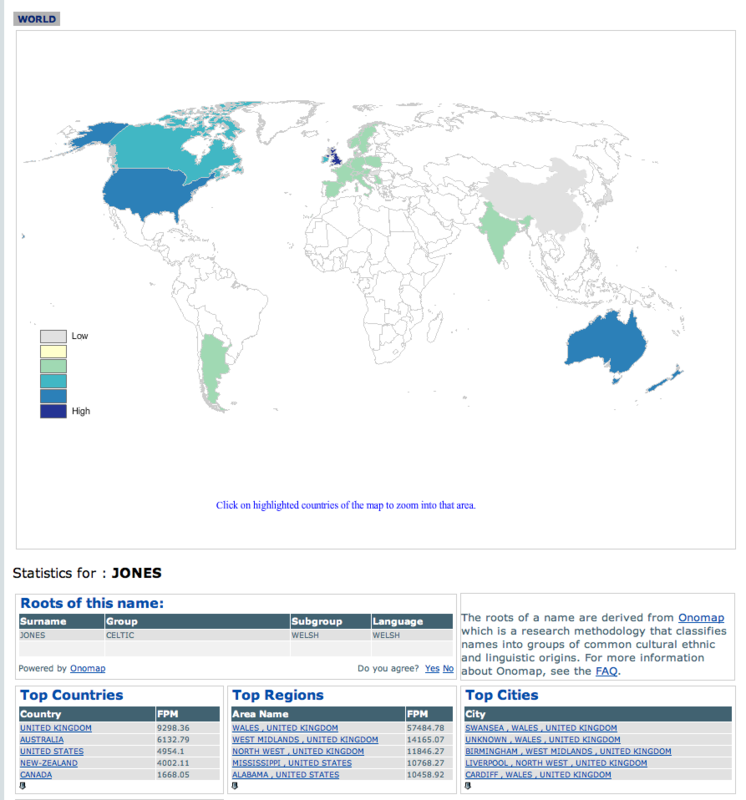 The "Jones" surname distribution worldwide. Jones is my mothers maiden name. In the US alone, the distribution of the Jones surname is nearly 5,000 FMP. That’s quite a huge increase from my father’s surname FPM of just 0.69! Second, this web site will also shed some light on the roots of your surname. See the Jones example above? It tells me that Jones most likely is of Celtic/Welsh origin. My Jones ancestor did indeed immigrate from Wales. Third, there are top countries, regions, cities, and even first names given with each surname. Again, the “Top Places” and “Top Names” are the results of statistical analyses of millions of pieces of data. It’s another great tool for a genealogist to use to further his or her ancestral research. This map really helped my genealogical research in the beginning. I focused my research on the dark blue area: the municipality of Loska dolina, Slovenia. And, over the years, I have found, that almost 100% of the Bovitzes, Bavecs, and even Bavetzes (and other variations of “Bavec”) who immigrated to the United States around the turn of the 20th century all came from this small part of Slovenia. I encourage all curious and eager genealogist and family historians to check out this wonderful web site. All you have to do is enter your surname of interest and an email. They promise never to give your email to a third party. Their database is immense, and the University is willing to share it with us researchers. It’s too good too not check it out. When I started in the field, I was amazed how often this number appeared. And, although I was pretty good at math in school, it took a while for me to “put 2 and 2 together,” so to speak. Let me review the basics. Please, I have no intention of insulting your intelligence, dear reader, because, unlike myself, you’ll probably grasp this concept right off the bat! I am a visual learner, however. I needed to see what everyone seemed to intuitively know about the “magic 16.” So, I broke it down. Now, I get it. I was born of two parents. Each parent had two parents. Therefore, I have four grandparents. 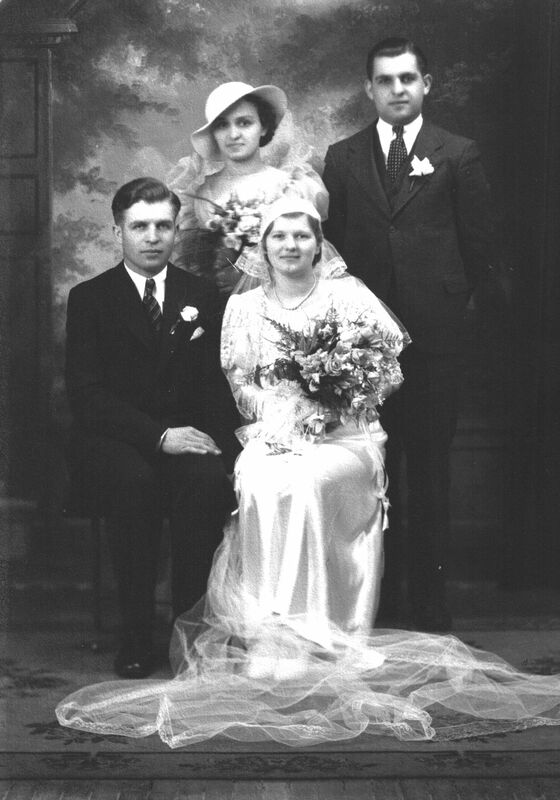 My paternal grandfather, Stanley Bovitz (sitting) on his wedding day. He died about 11 years before I was born. As an aside, perhaps part of the problem for me arose because I never had the opportunity to meet either of my grandfathers. My paternal grandfather (my father’s father), was tragically killed in a farming accident about 11 years before I was born. My maternal grandfather (my mother’s father) was never a part of my life. He and my grandmother divorced in the 1940s, after WWII. To be honest, I didn’t even know my grandfathers’ full names when I started my genealogy quest, so this may account for my disconnect. Each of my four grandparents had two parents, right? Thus, I have eight great-grandparents. Wow! See how quickly our family trees expand? Now, of course, you see the pattern. Each of my eight great-grandparents had two parents, as well. So, every person, myself included, has sixteen great-great-grandparents. People say every generation is about 25 years, but this number varies greatly in my experience. For an excellent article on “generations and genealogy” check out this link. When working on your tree, you may want to find your “16” as a milestone. It’s a good goal to aim for, but, it will take time and determination. Yet, the treasures you’ll find along the way will be worth every brick wall you must endure. Atrophy – Wasting away or diminishing in size. This web page is a great resource for genealogists. Many death certificates I encountered (and most when I first started my genealogy research) has a cause of death that is usually foreign to me. It doesn’t help matters that, in many instances, the causes of death were spelled phonetically either! One trick I learned soon after seriously diving into genealogy is that having a page bookmarked with “old-time diseases” was very helpful. Nine times out of ten, you will receive a death certificate with an unfamiliar disease listed as the cause of death. However, I have come across one death certificate where no additional resource was necessary. 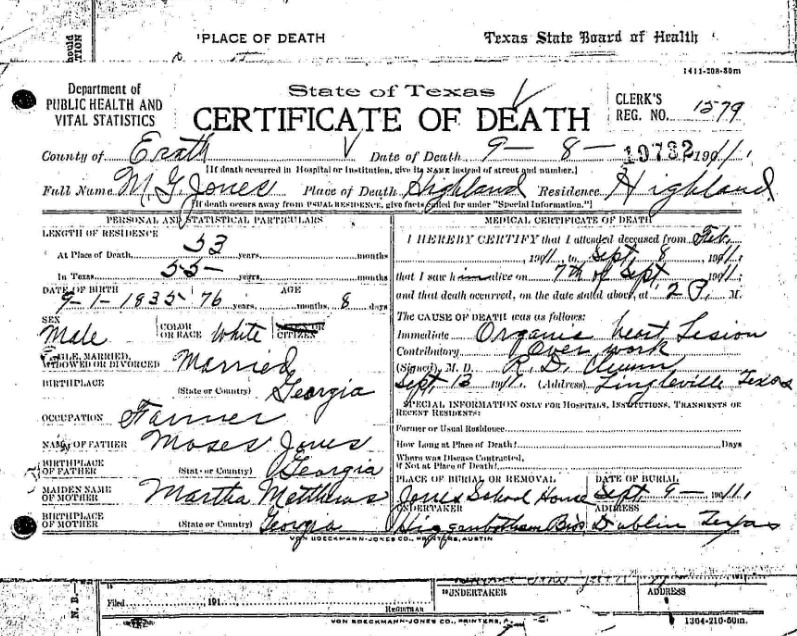 Death Certificate for Mason Grigsby Jones (click on image to enlarge). The immediate cause of death is organic heart lesion. This is not too far-fetched. He most likely died of heart issues, maybe what we know commonly as a heart attack. But look at the line just below, the contributory cause of death: over work! It’s amazing that a coroner would actually record “over work” as a contributory cause of death. Yet, I seriously wonder how many of our ancestors would qualify for the same contributory cause of death. Life certainly wasn’t easy one hundred years ago. 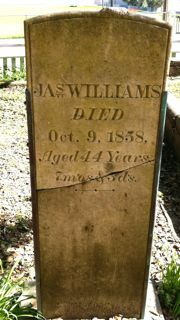 Mr. Jones’s “over work” cause of death is something to consider as genealogists. I believe we need to remember the ancestors we research were people, too. Yes, they died from diseases we have to learn and most of which are preventable today. And, yes, we are thrilled when we actually can find a cause of death. Nevertheless, I suggest — as we are story-tellers, too — we must try to keep in mind our ancestors were also husbands, brothers, sons, mothers, and daughters. Of course, when I find a death certificate, I am super excited. But, when I receive that death certificate, I do take time to honor the ancestor for a moment as well. It doesn’t take long, just a minute or two. Just enough time to acknowledge his or her life. I kind of just sit with it for a couple of deep breaths. On that note, I wish everyone a Happy (and healthy) New Year. First Cousin, Once Removed? Huh?